Floriade is back this year, celebrating Spring for the 30th year. The month long festival has an action-packed program, with something for everyone, including: music, cultural celebrations, horticultural workshops, artistic displays, entertainment and recreational activities. This year, Floriade opens on the 16th of September for four glorious weeks of fun, including special events such as: Night fest, which runs from 8-11pm on Friday 22 to Sunday 24 September, and Friday 29 September to Sunday 01 October. Night fest is an amazing combination of outdoor lighting design and production, and is perfect for the night owls! View the program here, and buy your tickets here. There is also a twilight concert, on Friday 15 September. The Canberra Symphony Orchestra will be joined on stage by David Bowie tribute act, The Ziggy Band, at the inaugural Floriade Twilight Concert. Click here for more details and to buy tickets. Dogs day out is on once again, this year being help on Saturday 14 October. Explore the delights of Floriade with your four-legged friend. There's doggie delights dotted around the park, a free photo booth, and a prize for the best dressed pup. Click here for more details. Whatever your interest, it's safe to say there is something for everyone! Get the most out of your Floriade experience by taking a lovely picnic to share with the family. Add a Floriade picnic hamper on to your booking and enjoy a picnic basket filled with fresh bread, local dips, seasonal fruit, cheese and prosciutto. This picnic hamper is just $45, and is available as an 'optional extra' when you have selected your dates. You can also add a local bottle of Shiraz or Semillon Sauvignon Blanc for just $20. Floriade is a pleasant walk from the city centre. One of a Kind Apartments is a short 5-10 minute drive to the city centre, or 25-30 minute walk. The Canberra Centre to Floriade via Allara St and across Parkes Way overpass will get you to the Parkes Way Entry in approximately 10-15 minutes. Walking from the Commonwealth Ave bus stop near Albert St will get you to the Regatta Point Entry in approximately 5 minutes. Park along Constitution Ave and walk to the Nerang Pool Entry via the underpass in approximately 5-10 minutes. For your convenience, bicycle racks provided by Pedal Power are located at the Parkes Way and Regatta Point Entry to Floriade. One of a Kind Apartment has free bicycles available for guests to use. This is subject to availability as there are limited numbers of bicycles. 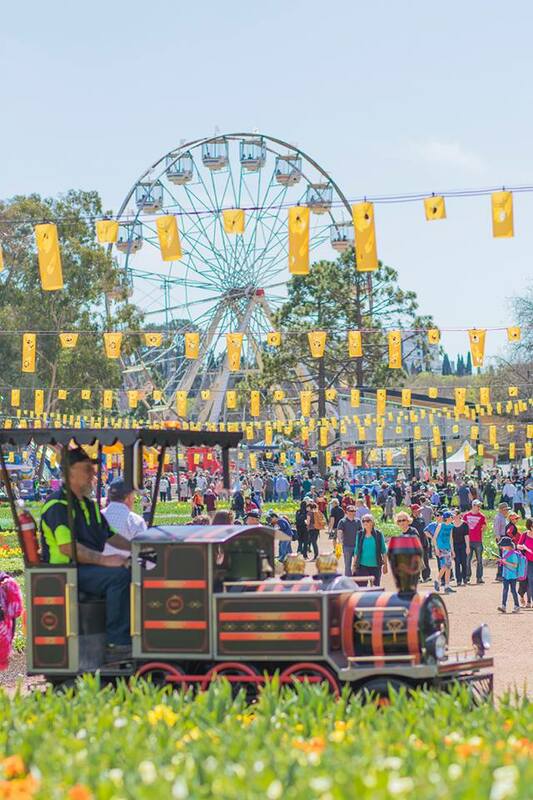 For the duration of Floriade (Saturday 17 September to 16 October) ACTION Buses will be operating a free shuttle bus from various Canberra city locations to Floriade. The shuttle will be running 7 days a week, 9am-5pm, and will be working in 45 minute rotations. To get to the city from One of a Kind Apartments, you could walk (25-30 minutes), ride (10 minutes), drive (5 minutes), or walk to northbourne and catch a bus (20 minutes, new bus every 10 minutes). For more information on the shuttle bus timetable and bus stop locations, please visit the Floriade website. If you haven't already, book your one of a kind Floriade accommodation now!